The Quartier des Spectacles is the heart of Montreal’s entertainment and cultural scene. That’s why many of the most sought-after condos in Montreal are near this spot. You’ve got at least 80 cultural venues jam-packed within a single square kilometer, and during the year the district plays host to about 40 festivals a year. Finding things to do isn’t really a problem—there are so many options the difficulty is figuring out what to do first! 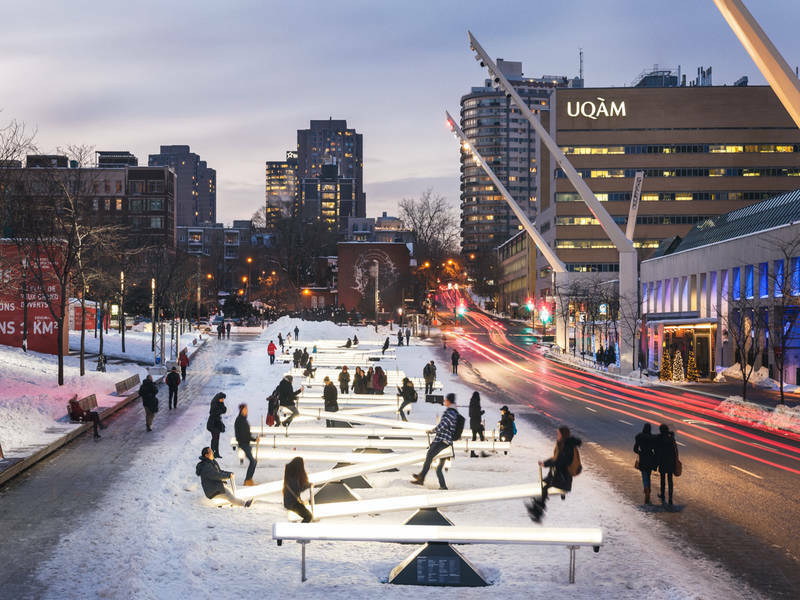 If you’re new to the Quartier des Spectacles, you should start your introduction to this area with a professional walking tour so that you can note down the places you’ll want to visit again for a closer and longer look. There are free walking tours available, and they can either be in English or in French. Private tours may also be held on request. These tours can let you see the iconic cultural venues of the area, along with the new buildings and the Luminous Pathway. Tours last about 2 hours, and they’re led by a guide certified by the Institut de Tourisme et d’Hôtellerie du Québec (ITHQ). Seriously, this is a no-brainer of an option. With 40 festivals a year, there’s a very good chance that there’s something going on in the Quartier des Spectacles that you won’t see again for another year. So definitely check what the current festival is all about. It may be a music festival filled with jazz performances, or if you visit in July it may be the famous Just for Laughs festival. Festivals can vary from dance to fashion and design, and even a festival on Bach! If it’s summer, you can go to the Place de la Paix and enjoy the Cinéma Urbain with its outdoor screenings of films. Walking around the streets of Montreal can be draining, so why not take a rest on a makeshift chair or even on the floor and enjoy and film you might’ve not seen yet! Everywhere you go in the Quartier des Spectacles, it seems like street art is right there in front of you. Just be on the lookout for murals and graffiti art, as bare walls here seem like an affront. The street art is so accomplished that the local street artists are achieving international prominence. A terrass is an outdoor bar where you can relax and enjoy a drink. You often get great views along with terrific music, but the vibes of the terrasses can be incredibly diverse. One offers a Japanese manga vibe where they offer sake and Japanese cuisine. Others offer beer and sunsets, while you may find terrasses that offer wine and views of great street art. The Quartier des Spectacle offers around 15 terrasses to choose from, and that’s a lot considering that it’s just one square kilometer. It’s like after every few steps along the way, there’s another terrific terrass to enjoy. Just keep in mind that this is the Quartier des Spectacles—literally the District of Spectacles. All you need to do is to walk around, and you will stumble upon a sight you won’t forget. In this place, it’s pretty much guaranteed.